Northern Virginia and surrounding areas, land and water recoveries. The cost depends on the type of search. A local land search has an upfront fee of $25 which covers expenses. In addition I work on a reward basis, that means you pay what its worth to you and what you can afford to have me find your lost item.The cost of a water search depends on the aquatic environment. For example, wading is a lot less complicated than a SCUBA dive. I am both pleased and honored to comment on Rob’s blog. 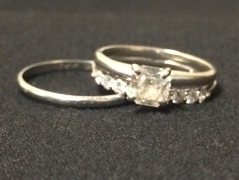 I was absolutely devastated when my engagement ring, wedding band and a family wedding band from 1931, were accidently dropped in the river while I was swimming with friends. I do not think the devastation and grief I felt at that time can be expressed in words. After my friend accidently pulled them from my finger, my husband immediately dove and redove in an attempt to reach the bottom of the river to retrieve them; however, the water level was too deep for him to reach the bottom. Fortunately, he and his dad are very “Macgyver” oriented and believe there is a solution to all of life’s problems. 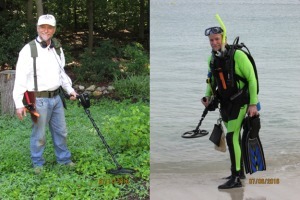 After telling my father-in-law what happened, he immediately began making phone calls throughout Virginia to inquire what the best underwater detecting gear was and where he could purchase tools to begin recovery. Fortunately, one individual he spoke with had heard of Ring Finders and suggested we contact a professional instead of attempting the rescue ourselves. Excited that a group of individuals like Ring Finders existed, we immediately made contact with a group from Ring Finders and were back at the location I lost them one week later. Unfortunately, when things can go wrong they will, and our area was hit with a heavy storm the night before the dive, completely altering the river conditions. They still attempted the search to no avail and promised to return the following year since it was too late in the season to attempt another dive that year. Due to health issues, the individuals that previously searched for my rings last year were unable to go down this year and suggested I attempt to make contact with another diver with Ring Finders – that’s when I found Rob and his lovely wife. As Rob mentioned, the ring was lost on private property and it was difficult to arrange everyone’s schedules to make the search happen. Throughout the confusion of coordinating schedules, Rob was gracious, understanding, helpful and considerate. When one date did not work with everyone, he would give me two or three more to work with, eventually making the search happen. He and his amazing wife drove over three hours with all of their equipment to give me one last chance of finding my lost items. While I was not at the sight while they searched, I sent lots of positive vibes, prayers and hope that this would work, and it did – because of them, their dedication, patience and skill set. They sacrificed their personal time, expenses for travel and equipment expenses because a stranger had hope and faith that her lost items could be recovered and that they had a chance of retrieving them for her. Rob and his lovely wife not only returned an heirloom that has been in my family since 1931, they also returned my wedding set, which can now also be handed down for many generations to come thanks to their dedication and thoughtfulness. I feel that recovering three rings from a river a year after they were lost, that were buried in two inches of silt, 75 feet from the dock in almost 9 feet of water is nothing short of a miracle. Rob and his wife proved to me that miracles do happen. So – if you are missing anything of value – monetary or sentimental, do not hesitate to contact Rob and his lovely wife and keep faith and hope that your valuables will be retrieved. He made wonders happen for me and I have no doubt he will try his absolute best to make them happen for you too.